20 percent more cargo volume in intermodal container transport - DAF Trucks N.V.
With a vision to further increasing intermodal container transportation efficiency, TelliSys presents a prototype of a tractor-semi-trailer-combination with an ultra-low fifth-wheel position that leads to 20% more cargo volume. Significant savings in fuel consumption and CO2 emissions per ton/kilometer are therefore possible within intermodal container transportation. TelliSys is a partnership between the IMA of the RWTH Aachen University, the European Intermodal Association, DAF, GEFCO, Goodyear, WECON and WESOB and aims to make possible the transport of containers with an internal height of 3 meters. As a result, 3 so-called ‘metre-trays ' can be stacked in a container, so that load volumes up to 100 m3 can be realized. Within the TelliSys consortium, DAF has developed a Super Low-Deck tractor. By lowering the chassis behind the engine and by the use of a very compact rear wheel suspension in combination with 22.5" wheels on the driven axle, a fifth wheel height of only 85 cm is achieved. In addition, the special Low-Deck tractor has a lightweight 4.0-tonne trailing axle with 17.5" wheels to achieve a GVW of 44 tonnes. For the project Goodyear has developed special new low profile tyres for the steered and driven axles. These tyres are characterized by a very low height with high load capacities. Elaborating on the DAF Super Low-Deck tractor’s fifth wheel height of only 85 cm, WECON developed a special lightweight trailer of just 3,830 kg. Just as important is the development of a new generation of 40 and 45 foot containers, of which the floor is considerably thinner while maintaining load-bearing capacity and torsional stiffness. On the prototype, WECON has fitted a folding curtain to underline the versatility of the TelliSys Intermodal Technology Concept. Obviously, in the development of the concept truck not only dimensions and load capacities have been taken into account, but full attention was also given to maneuverability, comfort and operational effectiveness. The TelliSys combination will now start an extensive field test with logistics partner GEFCO, in which truck, trailer and container will be used intensively within its intermodal transport operations by road, rail and water. "TelliSys has shown that it is possible to achieve 20% greater efficiency for container transportation," said intermodal consultant Heiko Sennewald, who is both partner and initiator of the project. "The field test performed by GEFCO will have to prove the practicality of the system.” The results will determine whether market introduction is feasible, also depending on market interest. In order to gauge this we will exhibit the TelliSys Intermodal Technology Concept in early May (5th till 8th) at the Transport Logistics exhibition in Munich. It is important to stress that this technology concept won’t be on the market on short notice." 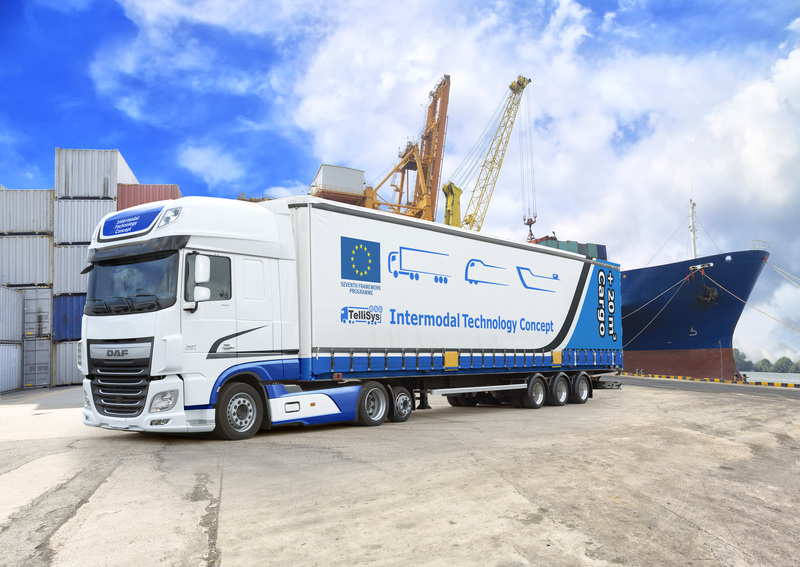 The “Intelligent Transport System for Innovative Intermodal Freight Transport” (TelliSys) promotes the EU’s objective of optimizing the performance of intermodal logistics chains and provides smooth and cooperative interactions between different modes of transport. The project has started in December 2012 and is funded within the 7th Framework Programme (FP7) of the European Union for a period of three years.